It’s a little bit coleslaw, a little bit art. Maybe it’s for dinner tonight? This recipe is the Sweet Winter Slaw from the cookbook I am obsessed with, Plenty, by Yotam Ottolenghi. I made this for the first time in Omaha when visiting family and then again on Saturday to go with the Black Pepper Tofu (from the same book) which is irrationally loveable. If I figure out where I saved the photos from that preparation I will post them soon too. 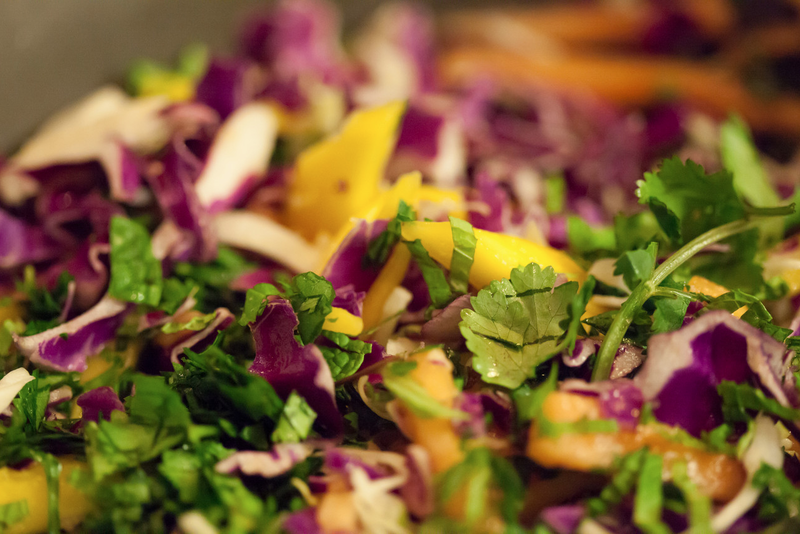 But this salad is not only easy (the chopping takes a bit of time but you can do it in advance) but the combo of papaya, mango, mint, cilantro and red cabbage (plus the candied macadamia nuts) is pretty stellar. Your guest’s taste buds will be at your mercy–you can serve charred, dried out chicken breast right after and people will still walk away thinking you are a genius. When we made this in Omaha we forgot to get macadamia nuts so we used pecans. The nuts are candied and then roughly chopped before being tossed in with the other ingredients. You can use peanuts as well. If you make this in advance, I think you can cut everything a few hours ahead except for the mint and cilantro. If you add the herbs an hour before serving (don’t toss yet, just add on top of the salad and put a damp paper towel on top of the ingredients) I think everything will still be fresh and fine. 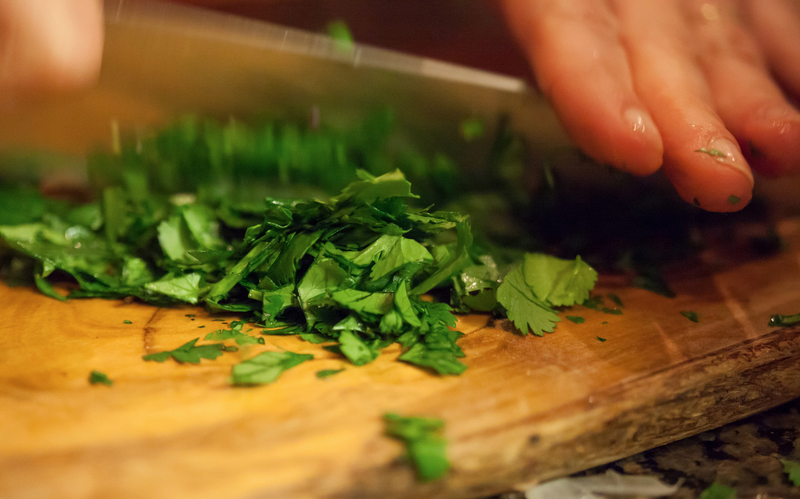 Realistically, chopping the herbs does not take a lot of time–but you may be space crunched as I am though so anything done if advance helps. The dressing can be made the day before. 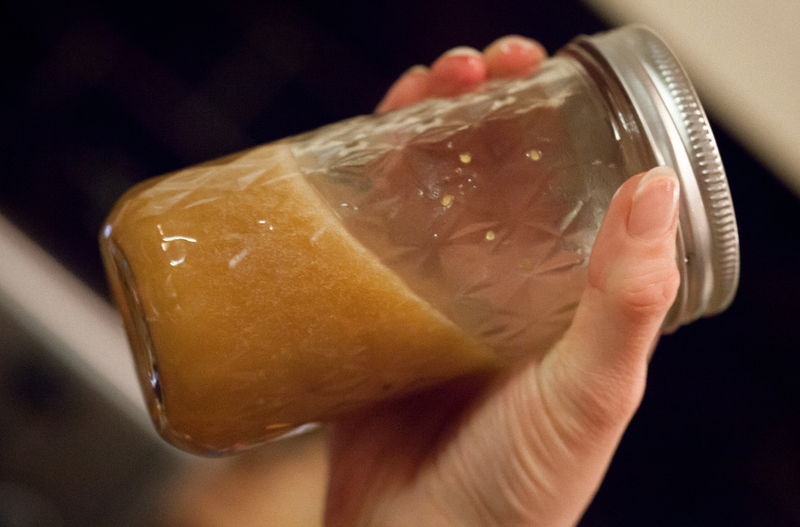 You may want to steal this dressing and us it on other greens or salads. Its addictive flavour comes from maple syrup, lime juice, lemon grass, sesame oil and chile flakes in it. Finally just before serving, toss everything together, pour on the dressing and serve. This will actually still taste pretty good the next day (if you have leftovers) though the herbs and nuts will be a bit moist by that time. When I made it this weekend I reserved some of the salad without dressing for the next day, figuring I could always toss some more if we ran out. 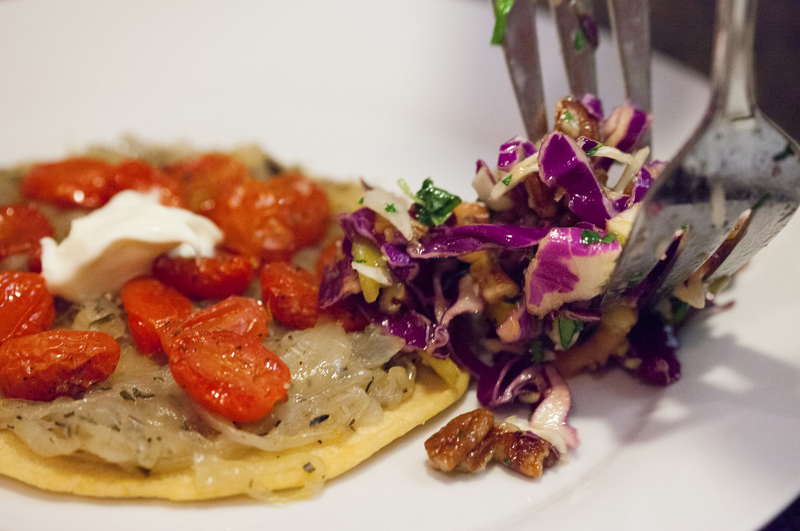 This image is from our Omaha dinner, we served it with this tomato and onion Socca. In the book there’s recommendation to serve this with roast chicken. Perfection I think! For the dressing: Place all the ingredients except the oil into a small saucepan and reduce over high heat for 5-10 minutes until syrupy and thick. 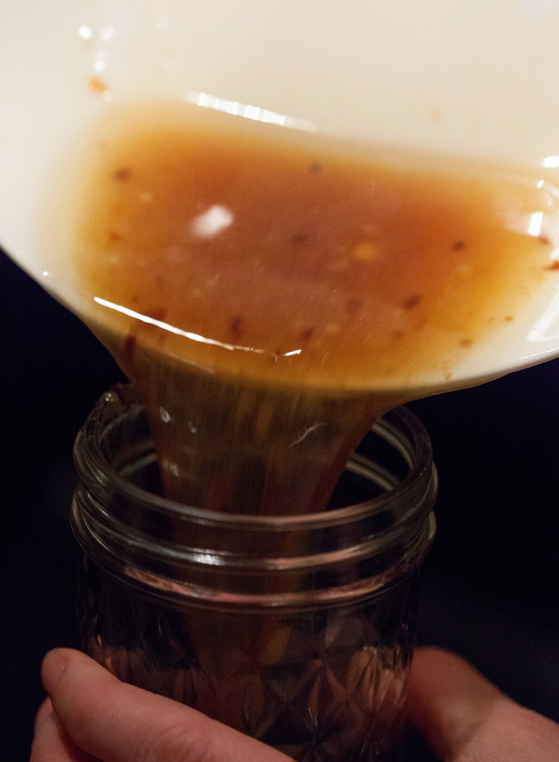 Remove from heat and once cooled strain into a bowl and add the oil. Set aside. 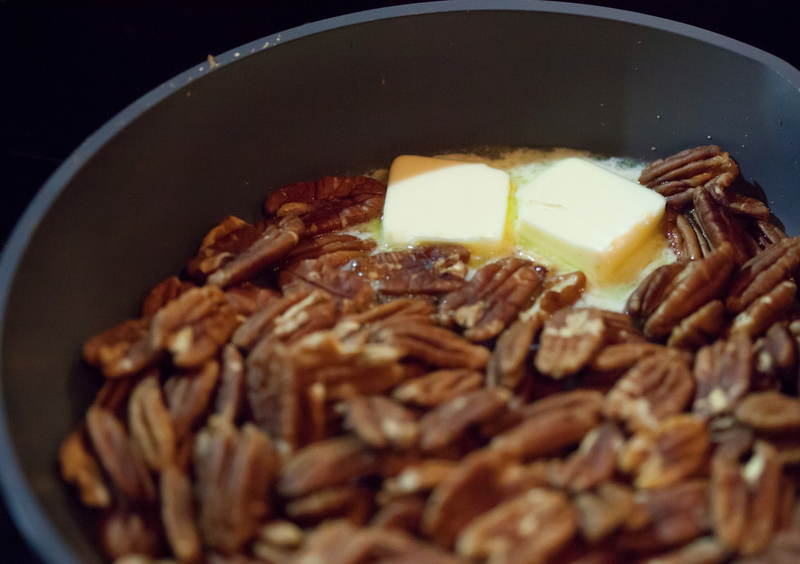 Place the nuts in a medium pan over medium heat and roast until lightly browned. Watch these and shake the pan occasionally so they don’t burn. Add the butter and when melted add the sugar, salt and chile flakes. Stir constantly so the sugar doesn’t burn and when caramelized (the sugar will be melted and gooey) remove from the heat and pour onto parchment to cool. Chop roughly once solid. Set aside. Put the cabbage and the rest of the salad ingredients into a bowl (including the nuts). Add your dressing and toss. 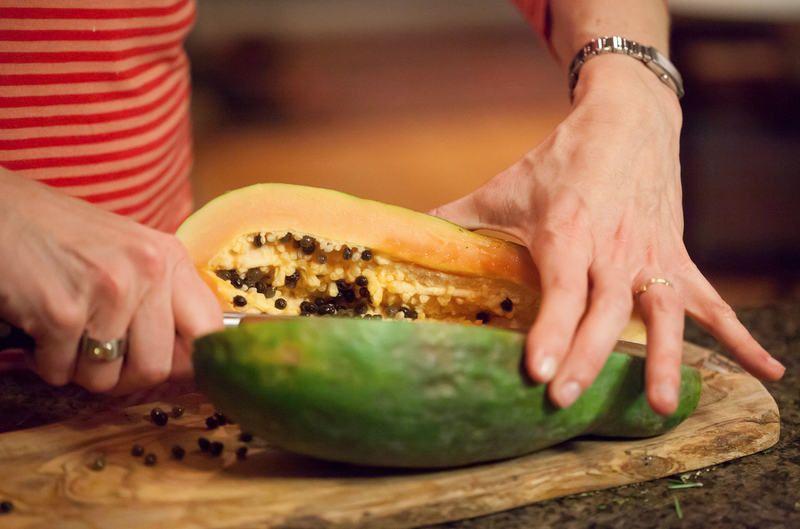 Give it a taste to see if it needs anymore seasoning and serve it up! yes, we all loved it! I think it will be a staple for me. Sue, the cookbook you reference looks fantastic. I’m going to order it on my next amazon order… Thanks. you will be sooooo happy! Wow – thanks for the incredible, different take on coleslaw!